We have a new show up in the gallery this week! 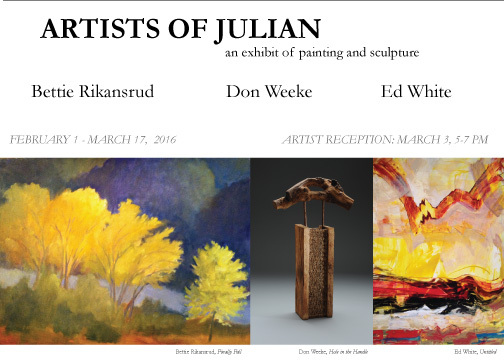 The Artists of Julian exhibit features three artists Bettie Rikansrud, Don Weeke, and Ed White. The installation brings together three distinctly different approaches to making artwork, all woven together by a sense of place. Bettie Rikansrud began painting at a young age. She received her degree in painting and printmaking from UC Santa Barbara and has spent past years teaching portraiture and fine art classes. 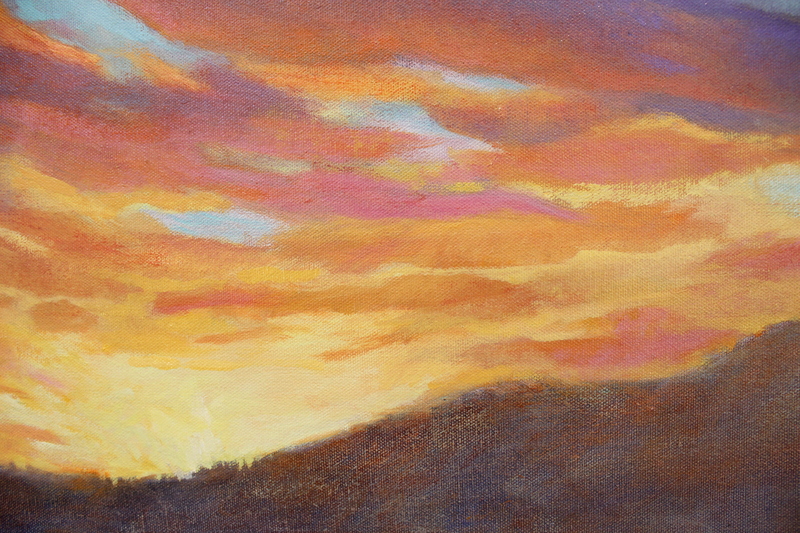 Rikansrud paints mostly with oils and draws much of her inspiration from the land and the atmospheric light that is particular to the Julian mountain area. Many of Rikansrud’s artworks are painted outdoors en plein air. Her website may be accessed here. Don Weeke uses natural fibers to construct intricately woven and assembled sculptures. Weeke utilizes both traditional and contemporary basketry techniques; he also burns, carves, and paints his materials to manipulate the surfaces. 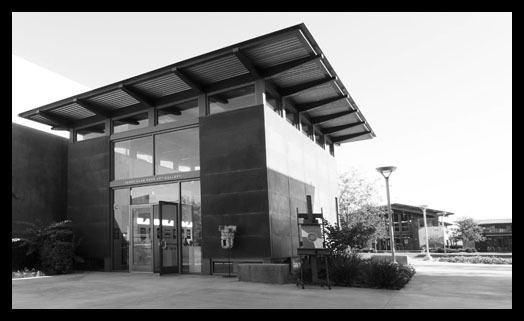 Weeke’s work has been exhibited frequently throughout California and the U.S. as well as being featured in many publications. Week’s website may be seen here. Ed White grew up in Southern California and began his career playing professional football first for the Minnesota Vikings and then for the San Diego Chargers. In 2004, Ed fully immersed himself in art making, spending a considerable amount of time modeling bronze figures. Currently, Ed is concentrating on his painting and takes much of his content from his experience as an avid sailor, the natural world, and most recently using abstraction as his visual language. Ed’s website can be viewed here. The exhibit will be on display from February 1 – March 17, 2016. There will be an artist reception at the gallery on Thursday March 3, from 5-7pm. This entry was posted in Uncategorized on February 2, 2016 by parkerartdepartment.